It's always interesting talking to people and their roles in the game development industry. There are some career paths that are narrowly focused, and others that have a more generalist feel. Level design definitely falls into the latter category. We're parts artist, designer, and scripter, and every company looks for different proportions of those parts. I lean more towards artist than I do scripter, and I've learned certain skills, like 3d modeling, to make myself more marketable. 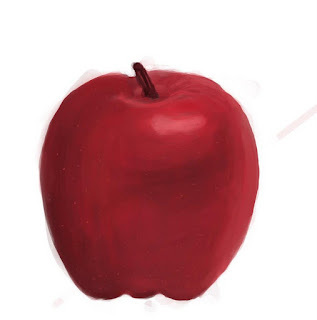 The next skill I want to learn and get a basic proficiency in is digital painting. I've always admired the concept artists, and so I set myself up for a Digital Painting Journey. The plan is to actively work on this every day for two months (or more, but for the sake of this exercise I'm lining it up with GDC). Each week I'll pick a theme; my first theme is fruit. Exciting, I know. Every day of the week I'll choose a reference image and spend one hour painting it. At the end of the week I'll choose one of the five hour-long paintings and spend the rest of the weekend on it: refining, adding details, etc. I've prepared for my journey by enlisting the aid of several colleagues who will help answer questions when they arise, and watching several videos aimed at beginners of digital painting. Since the holidays are right here, I won't officially start my journey until January, but I'll still be doing a fruit a night. Last night was my first digital painting, an apple. I'm probably going to create a photo album somewhere to host all of the images, and to keep track of any progress I'm making. My goal is to achieve a comfortable level of skill so that I can churn out a painting of an environment, prop, or idea in a timely fashion, and have it be recognizable enough to assist in communicating with my team. It's going to be tough, but I'm Real Dedicated! Special thanks to Alissa M for hooking me up with books and creating my exercise game plan.